Successfully Added 7.2mm CNC Metal Dual Glass Siswoo C5 Blade - 5 Inch HD Display, Android 6.0, 2GB RAM, 4G, Dual-Band WiFi, 2 IMEI (White) to your Shopping Cart. 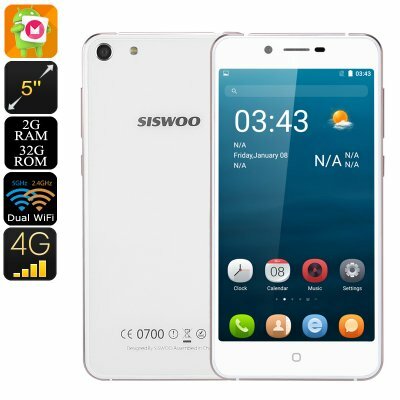 If you are looking for a high-quality yet cheap Android phone, the Siswoo C5 certainly is a smartphone to consider. With its Quad-Core processor and 2GB RAM, this affordable Android smartphone is capable of handling all basic cell phone features and mobile applications. It provides you with access to the App Store so you’re free to browse through the millions of latest Apps, games, and movies that can be installed onto your phone with the press of a button. All your favorite media can be enjoyed in crisp 720P resolution thanks to the phone’s 5-Inch HD display. By supporting IPS technology, you can be guaranteed to be provided with vivid colors and clear visuals no matter your viewing angle. Running on Android 6.0, this phone brings forth a great user experience that lets you enjoy all the trusted Android features. Coming with 32GB internal storage and a 32GB SD card slot, it offers plenty of space for you to store your files and media. The phone furthermore holds an epic 2000mAh battery. This cell lets you enjoy all the Siswoo C5 has to offer for up to 6 hours in a row. Therefore, you’ll be able to make calls, play games, and browse the web throughout the day without worrying about battery life. This cheap Android phone treats you to great connectivity. By supporting Dual-IMEI numbers, you will be able to connect up to two network providers at the same time. This brings along great efficiency for separating work and private life while using just one mobile phone. Your smartphone furthermore supports 4G and Dual-Band WiFi. Therefore, you’ll be able to browse the web at lightning speeds and download Apps in the blink of an eye no matter where you’re at. Whether you’re into mobile gaming, want to use the latest Applications, or simply use it to make calls – this Android phone is sure to meet your mobile demands.